There are so many inherently good things about bicycle camping – from fostering a healthy lifestyle, to practicing sustainable transportation, to experiencing new landscapes and cultures. I’m inspired to inspire you to consider getting out there for some bicycle camping adventures. I’ve laid out the incremental steps one might take on a journey from starting out as a non-camping cyclist to maturing into an intermediate bicycle camper, ready to learn advanced skills. By sizing up the journey ahead, beginners can understand their progress and make better decisions along the way. While I’ve broken up bicycle camping skills into beginner, intermediate and advanced levels for more efficient learning, developing into a bicycle camper generally doesn’t follow such a structured path. Your learning adventure will be a unique process of challenge and discovery. Enjoy the ride! Combining cycling with camping is my favorite way to spend time outdoors. As an outdoor lover and cyclist, but also as a person with a full plate of daily responsibilities, bicycle camping is about the easiest way I’ve found to quickly get away and really break through the everyday stress. Getting out bicycle camping on your own is just the start. Heading out with friends, family and larger groups adds a whole other level of fulfillment to the adventure. I could go on and on about how great bicycle camping is. I could tell you how it makes you healthier, more relaxed, more sociable and better looking. However, I’m fairly certain that you’ve already reached these obvious conclusions on your own. The gods of bicycle marketing know how to do their jobs. New equipment while getting started. New equipment for settling into your new bicycle camping routine once established. Ongoing equipment maintenance and upgrades. Traveling to bicycle camping destinations. Researching and practicing the basics. Researching and practicing intermediate and advanced level practices. Time spent out bicycle camping that could be spent doing other things. Pushing yourself to trying something new. Investing your time and money. Possible failure in establishing a new pastime. *I’ve left out the risk of injury as this balances favorably against the known benefit of exercise. I’ve also left out the cost of food considering home and camp cooking have relatively equivalent costs. 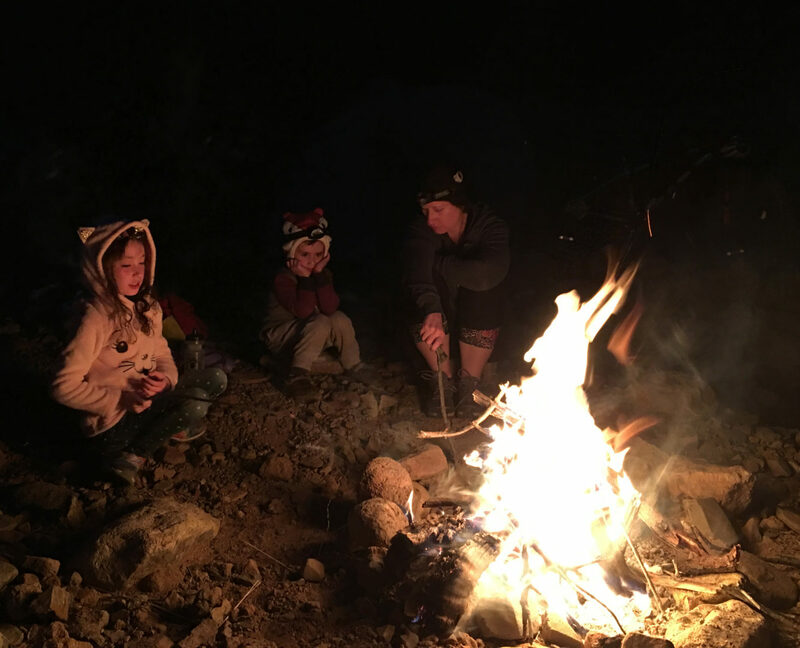 No sugar coating here, there is certainly a sizable mountain of costs you’ll have to weigh against the benefits of making your way towards your bicycle camping utopia. But I’ll also tell you that it is well worth it. What about bicycle camping brings up doubt for you? Are there challenges that have stopped you from starting already? Prioritize your focus on resolving the most significant barriers to getting started. Once you resolve the primary issue, remaining barriers will much more easily get resolved. The issue that most impacted me while I was getting back into bicycle camping was time management. I’m a busy father and entrepreneur and time is my most precious resource. I finally figured out a good strategy for scheduling my bicycle camping time. The ticket was to take overnight trips on Friday evenings. I could leave work early, ride in the late afternoon, camp out for the night, ride back early in the morning and get home by around 10 am to spend the rest of the weekend with my family. If you’re struggling with getting the ball rolling with bicycle camping, I hope there is one major barrier you can focus on, resolve and then start getting out there. Dismantle the barriers blocking your progress, while at the same time pouring fuel on the fire of your inspiration. Once I realized I needed more bicycle camping in my life, I fueled my inspiration by surfing Instagram. Digging into #bikecamping and #bikepacking, I realized that the bicycle campers had truly infiltrated cycling culture and made Instagram their home base. On Facebook I joined every group I could find with bicycle touring, bikepacking and bike camping in the name. And I also watched a whole lot of bike camping related YouTube videos and began listening to relevant cycling podcasts. That said, I strongly recommend looking beyond the internet for the best forms of inspiration. Look for friends, family or local cycling groups who are organizing bicycle camping expeditions. Bicycle shops and local cycling groups are focusing on leading bicycle camping trips. Searching for bicycle shops and local cycling groups with Facebook.com and Meetup.com is a good way to get connected to these groups. Having overcome any mental barriers and sparked up your inspiration, its time to begin your bicycle camping learning journey. What bicycle camping related skills do you already have? And what skills do you need to develop? As you get started there are many things to learn, so stay focused and avoid the temptation to try to learn to much at once. A prerequisite to bicycle camping is that you are a competent cyclist. Can you comfortably handle a bicycle on paved and gravel roads? Can you safely deal with automobile traffic? If you’re not yet comfortable with cycling, focusing on developing these skills is a priority. There are many resources available for learning safe cycling. The League of American Bicyclists and Cycling Savvy are good places to start. If you are new to cycling, I recommend spending 2 or 3 months of riding at least a few times per week before considering adding bicycle camping into the mix. For cyclists with a solid foundation of cycling skills, beginner-level bicycle camping is within reach. Carrying camping gear on your bicycle impacts your bicycle’s handling and will also slow you down depending on how much weight you’ve added. When planning your first bicycle camping routes, if possible, choose routes that are a little easier than what your normally ride. Growing your cycling skills, likewise expands your bicycle camping options. Increased stamina allows you to take on longer routes with more vertical gain. Improving your bike handling skills helps you more safely navigate bicycle camping routes that take you through rougher, hillier routes in varied weather. Developing mountain biking skills opens up a whole other realm of bicycle camping options. 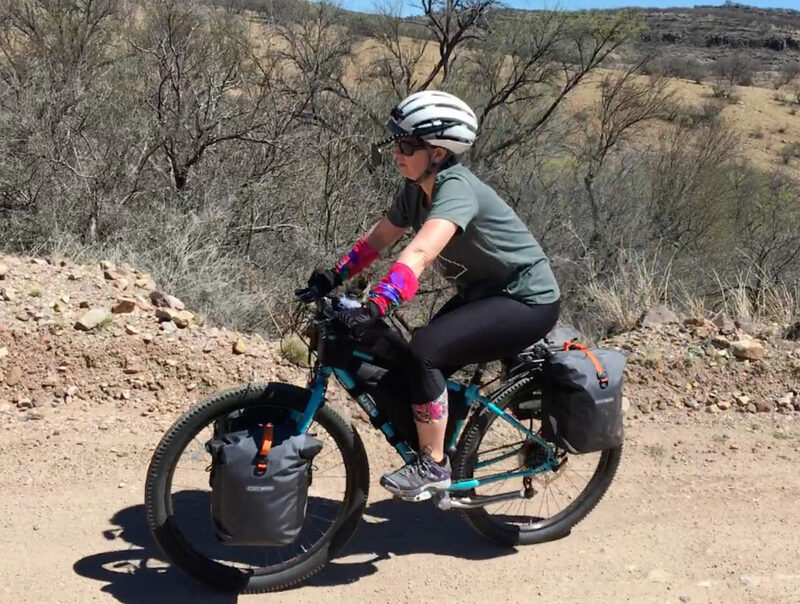 With the great variety in terrain, developing mountain biking skills is a long-term endeavor where you continuously opens up more and more bicycle camping (bikepacking) options as your skills further improve. If you’re interested in bicycle camping, you probably already possess beginner-level first aid and wayfinding skills (FABRW – Yes, I made that up). And if you’re a cyclist, you probably have beginner level bicycle repair skills. If not, spending sufficient time to round out ALL of these skills should be your first priority. While possessing beginner skills is sufficient for getting started, be aware of your limitations when considering more adventurous bicycle camping. What would you do if something went wrong? If you’re in cell phone range and close to a road, you can fairly easily deal with most problems that arise. However, the more remote you go in terms of distance from roads or cell phone range, the more you’ll be dependent on your own capabilities, especially when traveling solo. Familiarity with route discovery and navigating using paper maps. Familiarity with navigating using a smart phone. 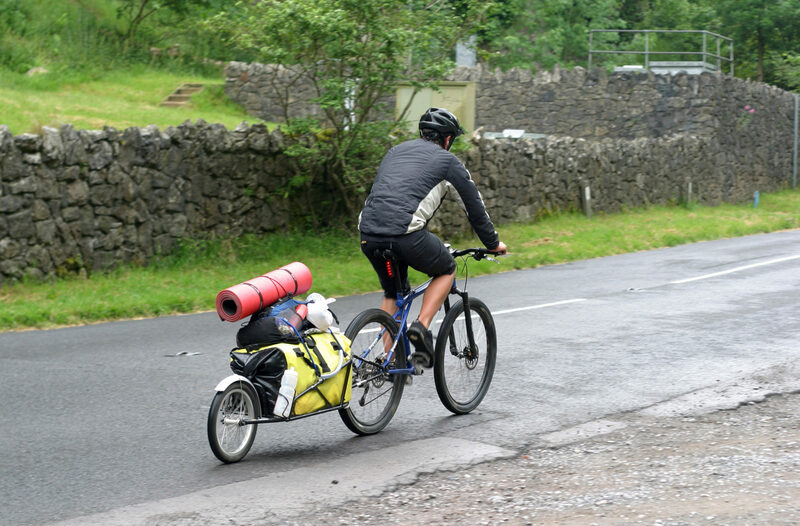 Developing a baseline of camping skills is fundamental for bicycle camping. Next week, I’ll be publishing our full write-up on learning camping fundamentals called Preparing for Your 1st Bicycle Campout (Even if you’ve never camped) Here’s a summary of the first half of the article, focused on camping skills. Size up your current level of “outdoorsiness” and plot your learning course. Acclimatize to the wilderness with 2-3 days of hiking or mountain biking in remote areas. Take 3+ hour trips, lounge about and get relaxed. Camp-out in your backyard for a night with just a tent, sleeping bag and pad. Keep it simple. Camp-out in your backyard for a second night and figure out all the stuff you’d like to bring with you for comfort, safety and entertainment. For your third night of camping, go car camping at a nearby campground. Bring ready-to-eat dinner, breakfast and snacks. Efficiently packing camping gear on a bicycle in a balanced way. Comfortably handling a bicycle loaded with camping gear. In the second half of next week’s. Preparing for Your First Bicycle Campout, I’ll be explaining how to get organized for your first bicycle camp-out. Prepare your bicycle for a bicycle camp-out by acquiring all of the camping gear you need and figuring out how to pack it up on your bicycle. For a fourth night of camping, bring your bicycle setup on a car camp-out for a practice run. For the grand finale, head out on your first easy bicycle camping overnighter! By easy I mean a route that isn’t too long or hilly, has low-traffic, arrives at a campground and is within cell phone range in case you are in need of any assistance. Even for highly experienced outdoors folks, I strongly recommend sticking to an easy overnighter for your first night of bicycle camping. Don’t dive into a multi-day adventure without at least a preparatory one-nighter. You’ll learn a lot more than you’d expect about your overall bike and camping setup. Developing your Intermediate FABRW skills will allow you to safely explore a bit further. Even when you’re not remote, intermediate FABRW skills go a long way to enabling fluid, self-sufficient bicycle camping. Acquiring intermediate FABRW skills is the most important aspect of advancing from beginner to intermediate level bicycle camping. Further improve your backcountry and all-around bicycle camping preparedness by carrying a satellite communication devise. Additionally, riding with a group is a smart idea when heading into remote areas. Your level of first aid preparedness while out on an adventure is relative to the first aid skill-sets throughout your group. Or if traveling solo it is relative to your ability to perform first aid on yourself. First aid preparedness is also very related to how remote the area you are traveling through. Most first aid courses focus on performing first aid on others. Many first aid operations can also be performed on one’s self. If the injured person is the one who knows the first aid technique this may not do anyone much good. To really be prepared in the backcountry, you’ll need to travel with multiple people skilled in first aid. Remoteness and the ability to get assistance from EMTs is another key context through which to consider your first aid preparedness. If you’re generally traveling where you could be reached by an EMT within less then an hour, the type of first aid preparedness is very different then when you’re in remote backcountry where you may face dealing with backcountry injuries for days or more. While most first aid is much more about knowledge than having a richly stocked first aid kit, packing a decent first aid kit is a smart practice and will certainly improve your first aid capabilities. Here are some recommended bikepacking first aid kits from Bikepacking.com. Developing intermediate level bicycle repair skills requires focus and study for most. This skill level can be attained through many years of servicing one’s own bicycles. To speed up the pace of developing these skills I recommend taking a bicycle repair course from UBI, BBI or something similar. Coupling that experience with buying and fixing up used bicycles or spending time working at a bicycle shop, will dramatically increase this pace. These days almost any bicycle repair can be looked up on YouTube.com. But proficiency at performing complicated repairs requires practice. A full set of intermediate level skills is developed through the experience of resolving a wide variety of bicycle repair issues. And to add to that, intermediate bicycle repair for bicycle camping combines the need for being prepared with knowledge in how to use a lightweight repair kit. Your ability to handle bicycle repairs in the field is intimately connected to the bicycle repair kit that you’re carrying with you. While an ability to improvise is part of the deal, being prepared with the right tool kit for your bicycle a very important part of the equation. Have a look at these bicycle repair kit recommendations from Bikepacking.com. For your first couple of bike campouts, do simple route planning. Ideally you’ll have a few bike camping friendly routes that you’re already familiar with. However, you may need to dive into some basic route planning and navigation. After a few easy bike campouts, you’ll probably be itching to expand your horizons. Accessing and searching through the full spectrum of published routes. Plotting out routes on paper maps and in mapping software such as Ride With GPS. Downloading map data for use in remote areas where cell connection is unavailable. Navigating complicated cycling routes with a variety of resources and figuring out re-routs as necessary. For searching for and planing your bicycle camping routes, combining the power of desktop computing and the simplicity of paper maps is ideal. During the search phase, using Google Maps is a great starting point. You may also want to search local blogs and forums for advice on cycling routes, camping spots and most ideally bike camping specific routes in the area. Reaching out to local cyclists and cycling groups can be another very fruitful method of sourcing routes. There are quite a few cycling specific route websites that are great for route finding. Ride With GPS, GAIA, MTB Project, Trail Forks, Gravel Map and Adventure Cycling Maps are all helpful resources to be aware of for bike route planning. When using Google Maps, the cycling route feature can be helpful to give you some ideas on cycling routes. That said, Google Maps overlooks routes that while a bit longer are far better in terms of traffic avoidance or scenery. Having a good map on hand is a nice counterpoint to using mapping software. While software allows you to deeply research a route, I find I get lost with all the zooming and switching between views. With a general route chosen, prepare for navigating. For simple routes, take mental notes while reviewing the route on your phone or map. When using bike routing software such as Ride With GPS for complicated routes, you can setup the built-in route planning features to help you navigate while riding. You can even program in turn-by-turn directions. For backcountry routes, the planning stage can be critical as a matter of basic survival. Be prepared by determining your sources of food and water and understanding what your access is to emergency support. Figuring out land access issues surrounding permitted use and access to private land is another important aspect when planning backcountry routes. And related to this, planning for finding permitted areas to camp along your route is an important consideration. There are many approaches to the art of bicycle navigation. While for some detail oriented folks advanced planning is preferred, for many the fun is in improvising and figuring it out as you go. Being comfortable with navigating while on the move comes through experience but usually works best for those with an innate sense of direction and time to explore. Mobile devices are great for enabling both highly scripted routes and improvisation. Choose the bicycle navigation tools that work best for you. Route improvisation is only recommend as an intentional choice. A Smart Phone with Google Maps or the other above mentioned cycling route software, with a cell phone connection. A GPS device or Smart Phone with maps downloaded, for functionality outside of cell phone range. Willingness to ask for directions. *As with route planning, it can be quite nice to have both a mobile device and and a paper map while out navigating. After you’ve established your beginner bicycle camping routine and solidified the necessary beginner and intermediate skills, you’ll be well positioned to begin developing some advanced skills. I’ve prioritized a list of advanced skills top-down for the skills that offer the most bang-for-the-buck for expanding your bicycle camping horizons. But there is no preferred course of action. Focus on the advanced skills that suit your interest. If and when you do decide to continue on with advancing your skills, consider your overall goals and focus on developing the skills that will work best in combination. So for example, if you are looking towards international travel it is probably a good idea to first focus on advanced wayfinding. Mountain Biking: While road cycling skills are sufficient to get started at bicycle camping and offers plenty of paved and gravel routes to explore, advancing your cycling skills into the realm of mountain biking will dramatically expand your horizons. Advanced Wayfinding: The ability to research, develop, navigate and publish new routes will allow you to advance from follower to trailblazer. Advanced Camping: Becoming a master camper will play a big part in figuring out how to stay safe and comfortable over the long-haul. Nutrition/Self Care: Extended bicycle camping can be quite taxing on the body. Taking care of your body through good nutrition, stretching, yoga is another key to comfort on a long journey. International Travel: Bicycle camping in foreign lands is an amazing way to explore the world. This also offers up plenty of travel, communication and logistical challenges to overcome. Advanced Bicycle Repair: Intermediate bicycle repair skills will get you out of a jam. Advanced skills will make you a hero among your friends. These skills include wheel rebuilding, frame repair, shock repair and a magician’s touch with creative backcountry bicycle repair. Advanced First Aid: Beyond just surviving, we’re talking about healing the world as you go. Medical diagnostics, prescribing medications, setting broken bones and stitching up wounds are some of the professional grade skills. Multi-Sport Bikepacking: Bikepacking enthusiats have expanded their adventures beyond the bicycle most significantly into #bikerafting. Other interesting cross sport adventures I’ve noticed involve bringing rock climbing gear and surf boards along for the adventure. Family Bicycle Camping: Comfortably and safely bringing your kids along for the adventure presents a variety of advanced challenges. Figuring out how to carry your kids and all of the extra gear is a big part of the challenge. Keeping them having fun and enjoying the ride is the other part. Adventure Racing: The recent bikepacking craze has strong roots in racing. And following this a variety of other multi-day, self-supported events have sprouted up. Optimizing your bicycle camping adventures around racing will advance your skills in many directions. It’s also a very fun way to go bikepacking with a lot of other folks and share in the camaraderie of competition. Group Leading: Organizing and leading bicycle camping adventures can be very rewarding in a variety of ways. Planning and leading bicycle camping trips effectively is certainly a skill onto itself. Remote Working while Bicycle Camping: Those lucky enough to be able to work remote and maintain a career while bicycle camping, have certainly had to figure out some advanced setups to stay connected. Making Ends Meet for Long-Term Bicycle Camping: A love of bicycle camping has encouraged some to learn to travel long-term on a budget, stopping every now and then for work and then resuming travels. Making A Living from Bicycle Camping: The luckiest bicycle campers out there have figured out how to make a living from their bicycle camping. Generally involving content creation and publishing, the skill-sets generally involve writing, photography and film-making or a combination. I Hope To See You Along Your Journey! And a warm welcome to the campfire! Here at CampfireCycling.com (Launching in a few weeks!) we teach cyclists to get started with the basics of bicycle camping. And then we teach you how to expand your horizons with intermediate and advanced skills. A tricky thing about starting something new is assessing how much to invest of yourself while you don’t know what you don’t know. The more experienced you are with other outdoor sports, the easier it will be to quickly assess if bicycle camping is for you. But for cyclists with limited outdoors experience, I hope this article really helps you understand the bicycle camping learning curve and how to get started in the most enjoyable and cost effective way possible. Wherever you are in your bicycle camping journey, we’re here to help. I’d love to hear about what bicycle camping adventure you’re up to and see how I might be able to help. I hope to see you at the shop or out on the trail!